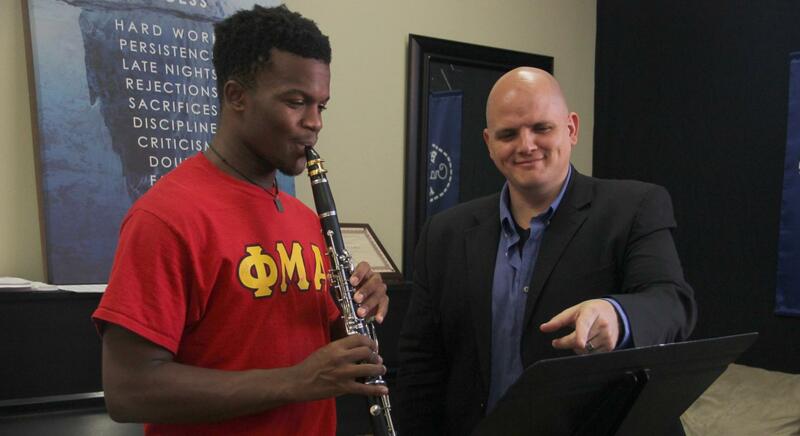 Instructor of Clarinet and Assistant Director of Bands Victor Drescher shows a Phi Mu Alpha student the proper clarinet technique. Drescher has taught at the university since 2013. Hoping to make an influence on aspiring music teachers, Instructor of Clarinet and Assistant Director of Bands Victor Drescher began teaching for the university in 2013. Drescher used his passion for the clarinet and pursued a career in music education with a desire to help his students increase their musical abilities. Drescher earned two bachelor’s degrees in music performance and music education and a master’s degree from Louisiana State University. After serving two years as the graduate teaching assistant, he became the Assistant Director of Bands at East Ascension High School where he worked for five years. Wanting to impact future music instructors more directly, Drescher took the position at the university but noted that the teaching style was a considerable shift from the high school setting. Drescher believes his teaching experience gives him an advantage when it comes to sharing helpful tips with his students. As an educator, Drescher constantly looks for ways to improve his awareness of music and learning in general. In addition to teaching clarinet, Drescher also performs as a soloist, orchestral musician and chamber musician. According to Drescher, he had the unique opportunities to appear as a guest soloist in Carnegie Hall at Texas A&M Commerce, perform with several different symphony orchestras across the South and play the House of Blues in New Orleans . “I love having the opportunity to take music and make those feelings and emotions come to life for myself and hopefully for the audience,” said Drescher. Drescher shared his proudest part about teaching. I am so proud of you , Victor ! Who knew all those years ago at Galvez Primary that you would be the influential person you are today . Good job !